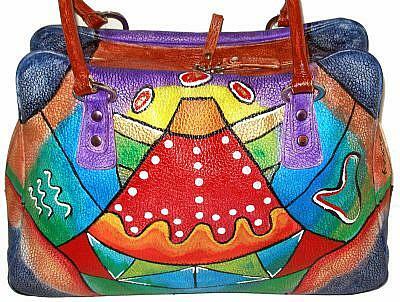 This is a repurposed, (recycled) colorful and roomy genuine leather satchel handbag made in Italy by designer "Cristian" that I painted in a wild and funky abstract style. With these bags, I've discovered a fun way to express my creativity and individuality. 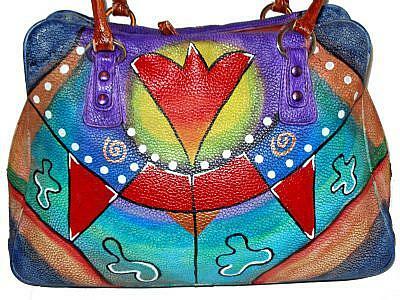 This particular bag was originally entirely pure white, including the handles. Although it wasn't in awful shape to begin with, it was a bit dirty and of course the white color showed every spec of dirt. 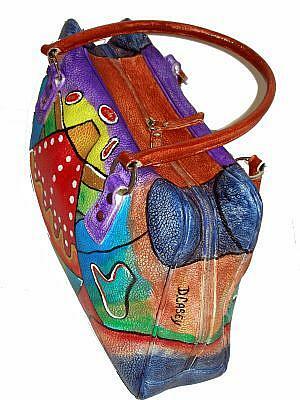 I do love color and wanted to infuse this bag with lots of it! All that white leather was just a big blank canvas crying out to me! Well, I heeded that call, and now, it is just brimming with lively colors from all angles! 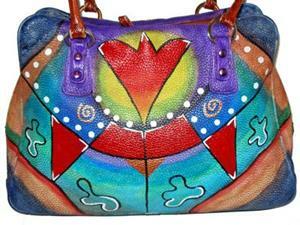 I just went wild with the design shapes/form and color and the result is a OOAK fun and FUNKY handpainted bag that your friends will wonder where you got! The bag itself is quite large, at 14" L x 9.5" H x 4.5" D and features double handles, with silver hardware rings, and double zip entry (with tabs) you can see the tabs kind of sticking up from the bag in the center. There are 3 large compartments inside the bag, with 2 zippered pockets; one is a large pocket that acts as a divider in the center section, and then there's another smaller pocket on the side for keys and such. I show several photos here from differing angles, so you can get an idea for what it looks like in real life. 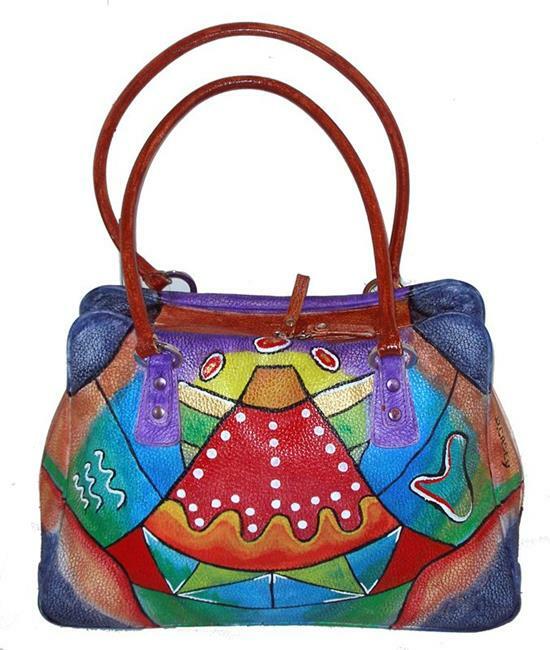 As I mentioned above, this leather handbag is by "Cristian" and the tag inside the bag reads: "Cristian - Genuine Leather - Made in Italy" (which I show a photo of as well).